Chloe soft leather shoulder bag. Removable, adjustable shoulder strap, 12" drop. Suede flap top with chain-clip and ring detail. Divided interior with suede lining and zip pocket. 10.3"H x 12.6"W x 1.8"D.
Chloe pebbled lambskin shoulder bag. Pale golden hardware, including raised loops at top. 1/3-flap top with leashed pin lock closure. Chloe mixed calfskin and suede shoulder bag. Approx. 11"H x 8.6"W x 4.3"D. Flat, stitched top handle Removable shoulder strap. 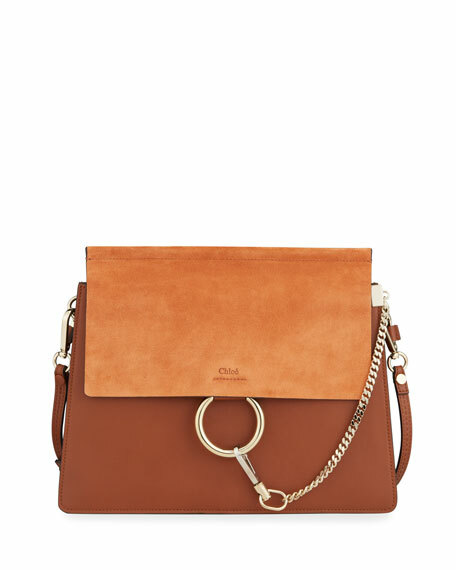 Chloe mixed calfskin and suede shoulder bag. Approx. 11"H x 8.6"W x 4.3"D. Flat, stitched top handle Removable shoulder strap. Flap top with chain-clip and ring detail. Magnetic slide-hook closure. Exterior, dual side zips expand bag. Divided interior; suede lining and zip pocket. "Faye" is made in Italy. Rag & Bone shoulder bag in vegetable-dyed Italian calf leather. Folded, logo-riveted detail at sides and base. Removable leather-link chain strap. Envelope flap top with magnetic closure. Interior, calf suede lining. Leashed zip pouch. 7"H x 8.3"W x 2.5"D. "Atlas" is imported.